If you lie about being awarded military honors for profit, you can now be subject to criminal prosecution, according to a new law signed by President Obama today. The Stolen Valor Act of 2013, introduced in January by Rep. Joe Heck (R-Nev.), "makes it a Federal crime for an individual to fraudulently hold oneself out to be a recipient of any of several specified military decorations or medals with the intent to obtain money, property, or other tangible benefit," the White House said today, announcing the signing. The law was the latest attempt by the government to help protect real military heroes from phonies. The original iteration of the bill, the Stolen Valor Act of 2005, had been in effect for six years before the Supreme Court ruled it was unconstitutional. At the time, the law was written to say it was a crime simply to lie about military service and awards - a broad characterization the Supreme Court said violated a person's First Amendment right to free speech. A new version of the bill, introduced by Heck in late 2012, narrowed the act to say the liar must be attempting to somehow materially profit from the lies, making the would-be crime more akin to fraud. A tweaked version of that bill was reintroduced in 2013. President Obama took a hard stance against military phonies last year when he announced a new government website to track awards for legitimate heroes. "It may no longer be a crime for con artists to pass themselves off as heroes, but one thing is certain - it is contemptible," he said in reference to the Supreme Court's ruling in 2012. "…[N]o American hero should ever have their valor stolen." 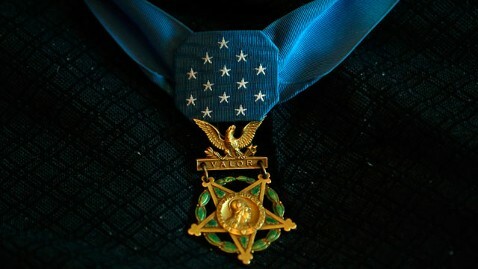 CLICK HERE to visit the Department of Defense's website listing the top military honor winners.